Norcold Refrigerators are the brand to consider when you are looking for a compact refrigerator, portable refrigerator, or RV refrigerator. A division of Thetford Corporation, a leading manufacturer of RV waste disposal systems, Norcold Inc., is by far the leader in portable refrigeration. Many of their refrigerator models are Gas Absorption Refrigerators which is a refrigerator that uses a heat source that provides the energy to drive the cooling system. This way the refrigerator isn't dependent upon electricity to run its compressor (like most standard refrigerators). Because electricity is so unreliable on an RV, boat or similar type of transportation unit a gas absorption refrigerator is the best way to go. The gas absorption refrigerators work in much the same way as a compressor refrigerator does, but the chemical reaction needed to produce the sub zero temperatures in a gas absorption refrigerator can be accomplished with no moving parts as it's caused only by heat. Because of this set up, gas absorption refrigerators are less prone to mechanical failure during their lifetime (assuming some routine general maintenance). These refrigerators typically can be plugged in to a regular outlet at home or into a car lighter. That is what the AC/DC stands for. While these models aren't quite as small as the portable ones listed below, they still are great for RV's or even for cabins. Quite often we've heard of people attaching solar panels to refrigerators like this in cabins without electricity. These really are great for camping, tailgating or driving long trips in the car. This way you'll have easy access to cold storage foods and some of them can even heat food up as well. No matter what size of recreational vehicle you may have, whether it’s a highly versatile class c motor home, a functional trailer, or even an exotic class a, an upgrade on your portable or compact refrigerator might be what you are looking for. If so, you can be assured that Norcold has this type of unit down, well...cold. Their entire line of products are some of the most reliable, well built units in this category that we've seen across the board. QUIET AS A CHURCH MOUSE: They are by far some of the quietest units on the market today. VERSATILE: Some of the portable units allow you to simply turn the dial and turn your portable refrigerator into a portable freezer! SPACE & STYLE: Many units had better use of space and a sense of style than their full sized counterparts. EASY TO USE & CLEAN: They take into account where and how their refrigerators are going to be used and many of the interiors of these units won't tarnish or rust and are extremely easy to clean. The Ultraline 1210 is one of the most impressive RV refrigerator products we've seen yet. 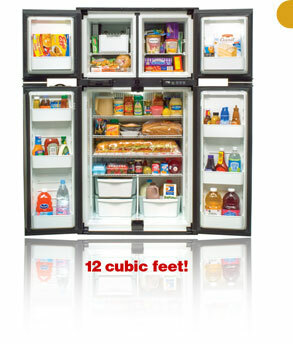 It has 12 cubic feet of cold storage which is certainly impressive for an RV refrigerator. Additionally, it's unique four door design is both extremely attractive and functional as it greatly minimizes cold air loss. It's steel frame insures it will have a long, trouble free life and keeps it from becoming scratched, damaged or corroded over time. It comes both as a gas absorption model as well as an electric only (Model 1210LRAC). Refrigerator Reviews: We definitely have our favorites in this line of refrigerators -- we reviewed a number of units in each category: Gas Absorption, AC/DC and Portable.